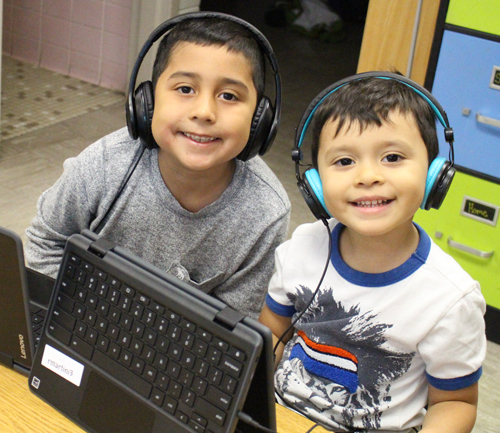 Students in Fridley High School’s International Baccalaureate (IB) Diploma Programme (DP) Level 5 Spanish Class aren’t just creating waves; they’re protecting them. As part of the class’ study of how to protect the environment, the students posed the question ‘What can Fridley do to protect our environment?’ The class decided to further educate fellow students and staff on how to cut down waste and the overuse of natural resources, particularly in the area of disposable food and drink containers. 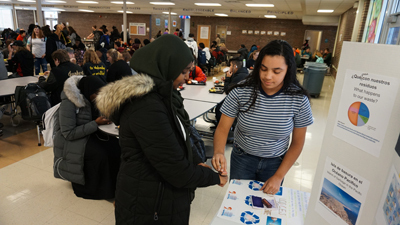 The students’ information campaign included a display in the high school cafeteria during lunch on December 3, 2018, that showed where items from everyday use end up, including the Pacific Ocean. 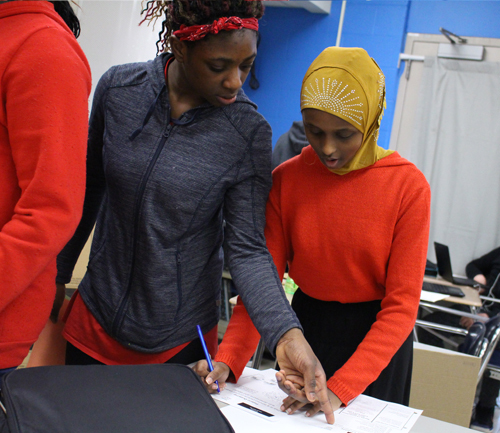 Left photo: Fridley High School student Simone Almberg stamps the back of schoolmate Hodan Yusuf’s hand as acknowledgement of Hodan’s pledge to increase recycling of materials. 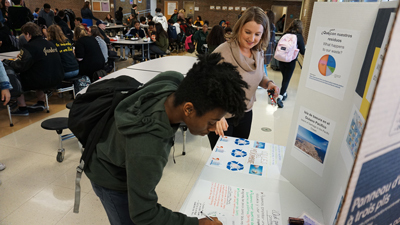 Right photo: Fridley High School student Valentae Morehead adds his name to the list of students pledging to increase their recycling as Fridley High School Spanish teacher Emily Latzka looks on.